Pimples are a skin condition that affects many people on the face, neck, back and shoulders. It is also an inflammation of the skin in which the oil glands become infected with bacteria. Excessive sebum secretion by the oil glands is the primary cause to this problem. First wrap an ice cube in a piece of cloth. Then, hold it on the affected skin area for a few seconds. Wait for a few minutes and repeat the process. Ice helps improve blood circulation to the affected area and tightening the skin pores. It can be used to reduce redness and swelling of pimples quickly. 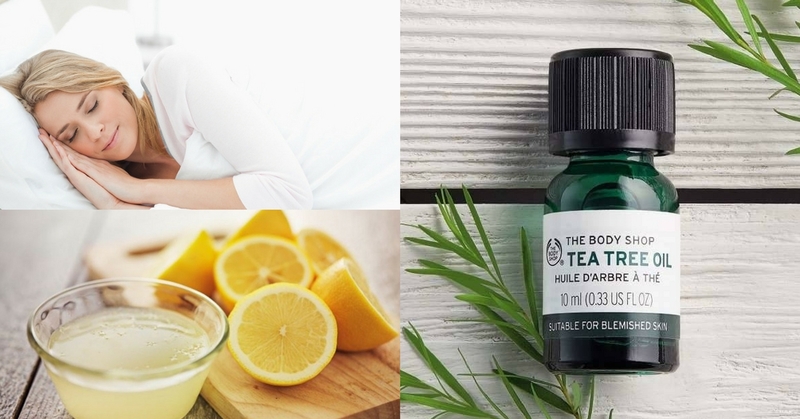 Use a cotton pad or cotton ball to apply tea tree essential oil on the affected area. Next, rinse your face after 15 to 20 minutes. Tea tree oil has antibacterial properties that can help fighting the bacteria which causes pimples. Besides, tea tree oil has soothing properties that helps to reduce the redness and inflammation of pimples. Dip a clean cotton in fresh lemon juice and apply it to the pimples before going to bed. Lemon juice is rich in Vitamin C that helps to dry pimples faster. Do remember to use fresh lemon juice instead of bottled lemon juice which contains preservatives. “Get your beauty rest.” Stress and lack of sleep are one of the main causes of pimples. Healing and eliminating toxins happens at the same time while sleeping. Hence, it is vital to care of our skin and prevent pimples by getting enough sleep. Exercising regularly also helps in reducing acne problem as it provide stress relief while getting the blood circulating. This will help to remove dead cells from the body by sending oxygen to you skin cells. Have a balanced diet by avoid consuming too much sugar and drinking plenty of water daily to prevent acne and pimples. Taking too much sugar will create inflammation and clog up the pores. Do try these homemade face packs and follow these essential tips for healthy, glowing, and pimple-free skin.